Ahh this is one of my favorite series hands down! 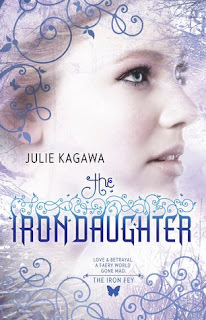 I'm totally faerie obsessed too so I loved how Julie Kagawa brings the myths and legends together with the characters. You'll love The Iron Queen!!! I have been looking at these books for a while now, but after reading this I think I will go ahead and give them a try. Btw enjoy the blog, new follower. Hi there, new follower here every which way btw lol. Your blog is absolutely beautiful! I can't read this review because I haven't read the series. Nice review! I loved the Iron King series, but haven't gotten into the newer ones. I just started the first book in this series! It looks so good and I have heard nothing but awesome things about it! I'm glad to see that you are liking the series, too! I'm an old follower but with a new blog! Please come check it out! The Iron Daughter is fantastic installment in the Iron Fey series and I definitely recommend it. People should really consider reading it, because it will leave you aching to read more!